Here is the original Norm and Marie Sweeny family, some years ago, bundled up for the snow and clearly in their element. In 2017, the Sweeny family celebrated many milestones including Grandmother’s 90th birthday, Aunt Susan’s 60th birthday, Mom and Dad’s 30th anniversary, Alex and Levi’s 30th birthdays, and Matt’s 21st birthday. We were happy to be able to gather in Illinois to share a Thanksgiving weekend of celebrations together! The family has grown over the years, as you can see…the photo below is even missing 4.5 grandchildren/great-grandchildren who couldn’t make the trip out from California. 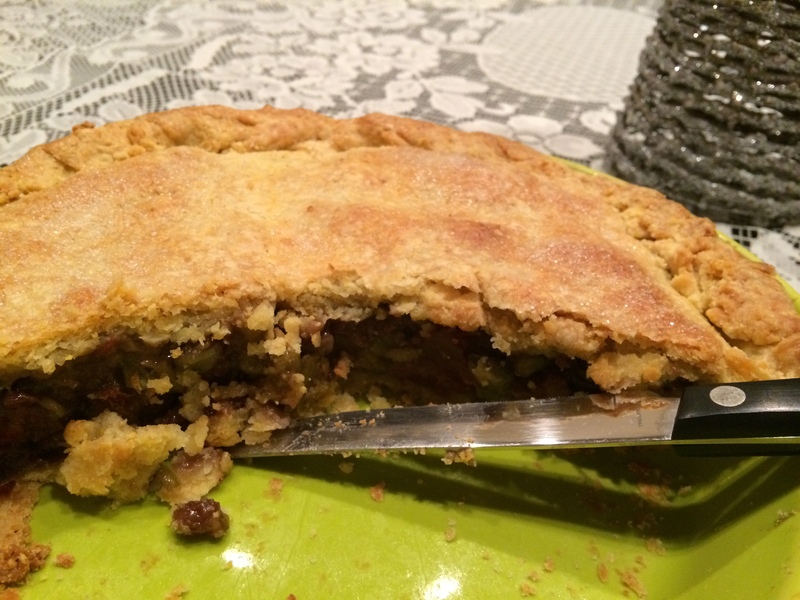 Although many delicious desserts and savory items were made and consumed as part of the festivities, for the purposes of the blog I will naturally focus on the pie I baked for Thanksgiving: Maria’s Double Crust Walnut Pie. This pie is unique on several accounts, but, like many good things, begins with a bunch of butter. 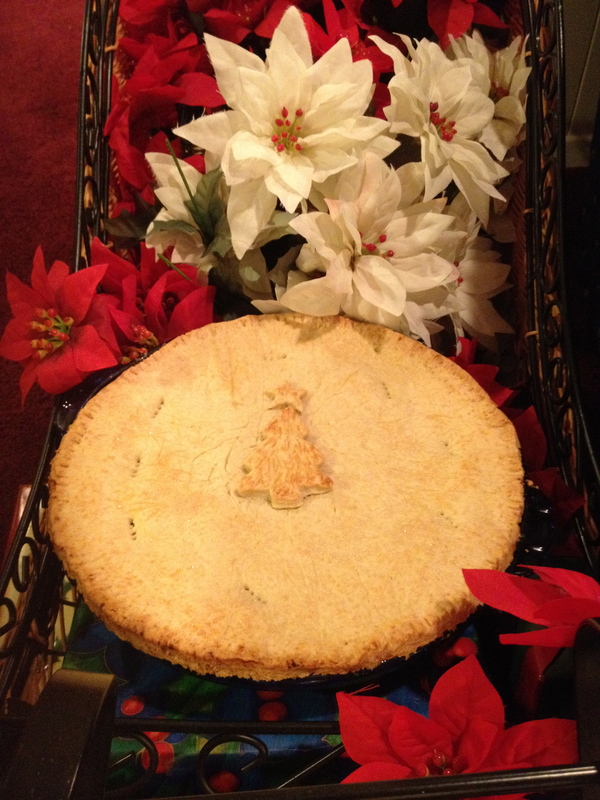 Maria must be a special lady, because she has a special pie crust recipe in Pie to be used with this very special and delicious recipe: Maria’s Shortbread Pie Pastry. It contains much more sugar than a typical crust, as well as an egg and lemon zest. 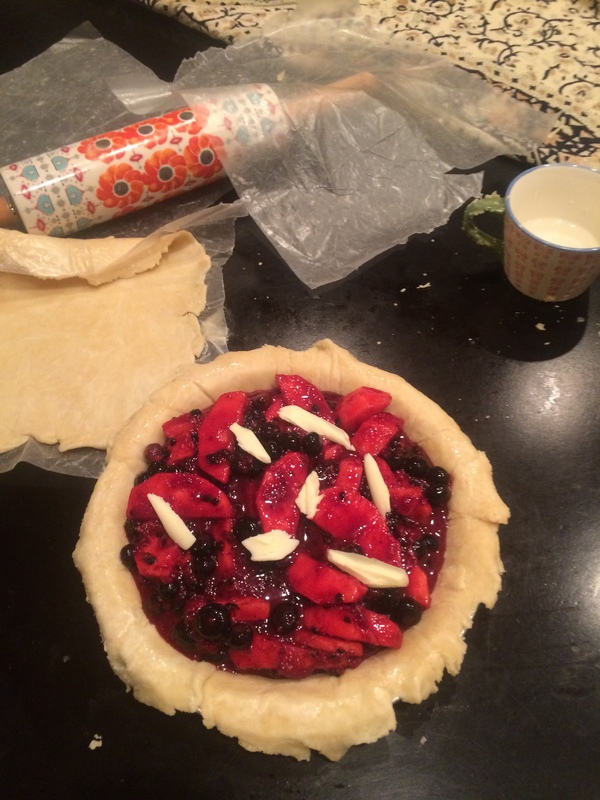 In fact, the crust has about the same number of ingredients that the pie filling does. Due to the egg, the crust has a heartier, sturdier texture than average. Part of the uniqueness of this pie is that is meant to be baked in a springform pan. However, my aunt did not have a springform pan at her home (nor do I have one at mine–we’re more of a pie than a cake family clearly) so I slightly adapted the plan and used a deep dish pie pan. 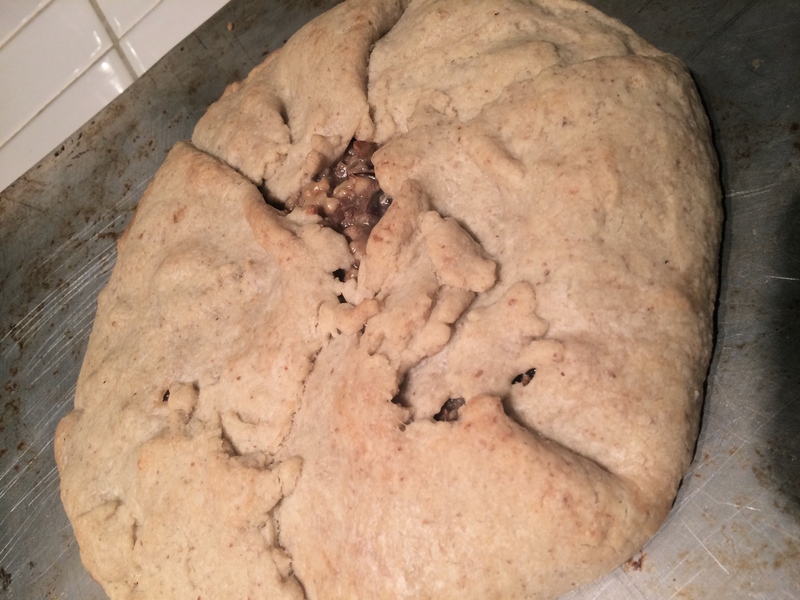 The recipe gives direction to add “ropes” of dough to the inside of the pan as pictured before pressing the dough flatly up against the sides of the pan. As far as I could tell, this just served to form a thicker pastry around the edges and hold the pie together more concretely. And the crust is such a delicious and important part of this dessert. I think it’s a good move. 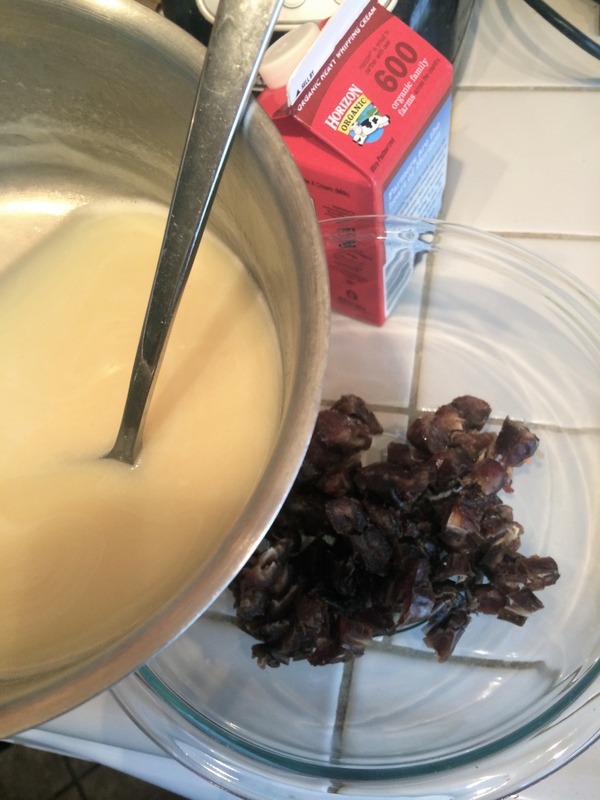 The pie filling is made from walnuts that get boiled with sugar and water and added to honey and cream. Nothing to object to there. The top crust is brushed with an egg glaze, and the final result is drool-inducing. In this shot here you can see the true decadence of the filling. 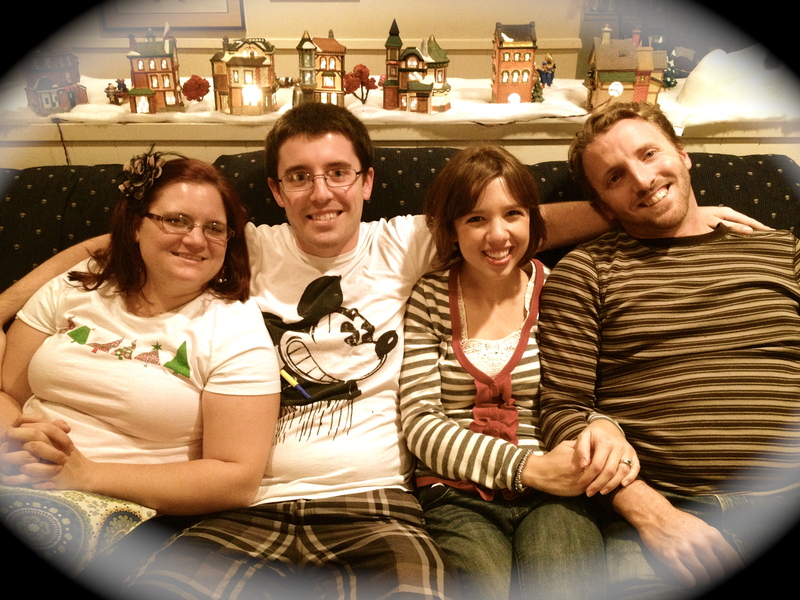 I’m sharing a few more pictures from the Sweeny family Thanksgiving weekend below. Enjoy and have a beautiful week! When you turn 90 you get two cakes. A little help with the candles! Unwrapping a birthday birthstone gift. Okay, wow, I just now noticed the double smiley face. That is some serious sucking up. 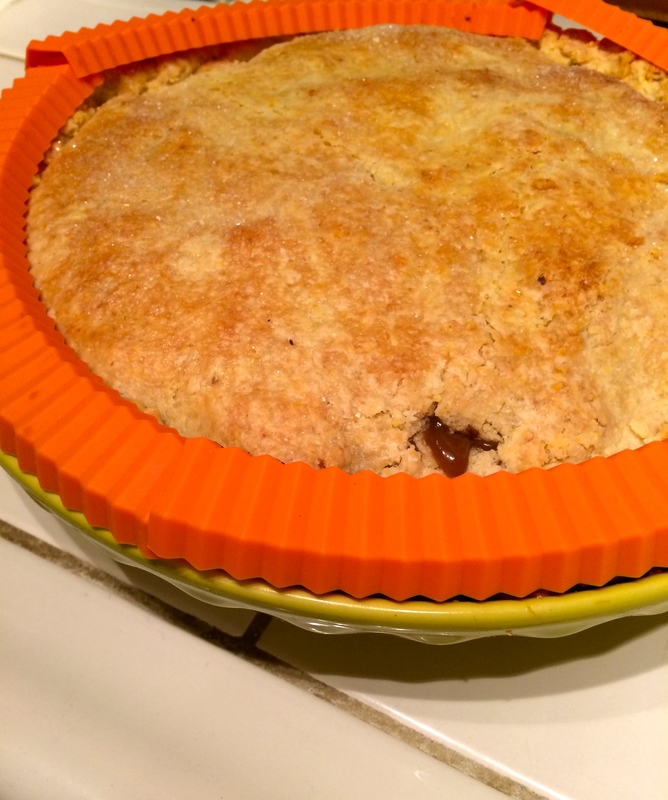 So yes…I will have PLENTY of 2015, February, current, hot-off-the-press pie stories for you. They’re coming! 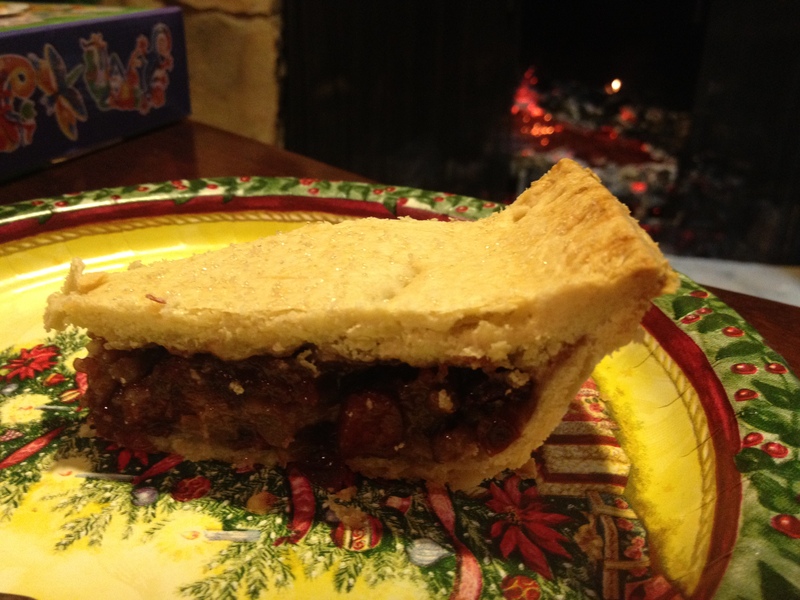 I suspect we North Americans don’t eat enough mincemeat. 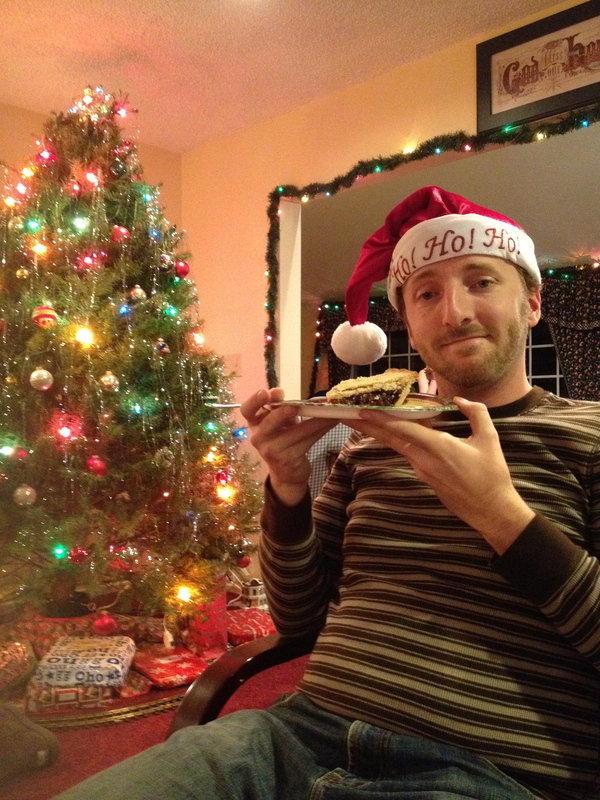 It truly has become my favorite Christmasy pie. 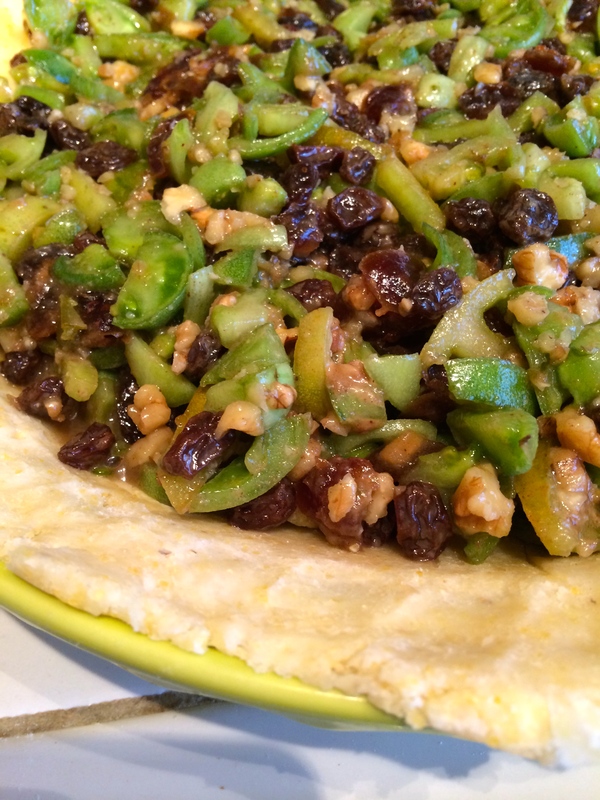 This is a delicious variety; in addition to the finely chopped green tomatoes*, we have here raisins, walnuts, dates, white sugar, brown sugar, cider vinegar, flour, cinnamon, ginger, cloves, salt, lemon zest, and butter. *Boy, is that ever a time-consuming activity. Be prepared for wrinkled fingers and passing waves of anger. The crust used for this recipe is a cornmeal crust. Interestingly, but not surprisingly, cornmeal is paired with green tomatoes in Ken’s other recipe as well. It makes sense. When I think of green tomatoes, the first thing I think of is (no, not pie) delicious battered-in-cornmeal-and-fried green tomatoes with remoulade, such as some that I ate in New Orleans not a month ago. Yummmm. 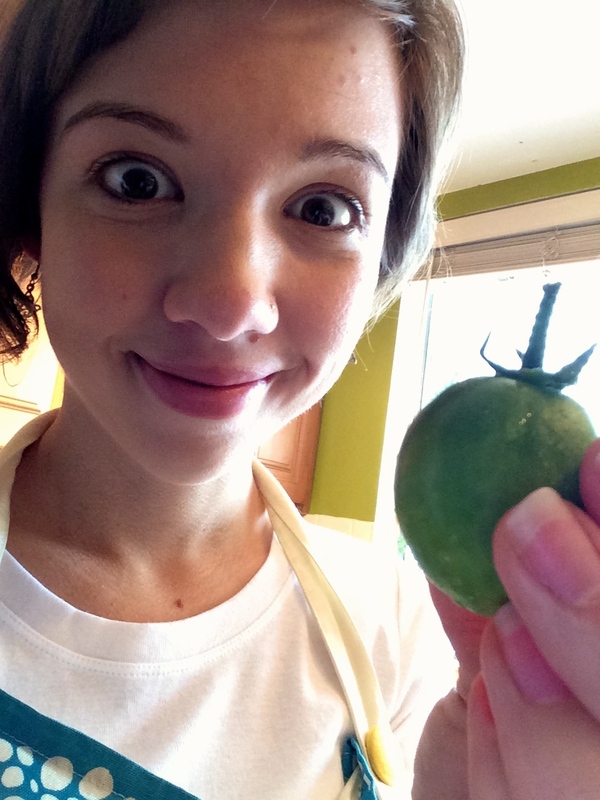 Clearly green tomatoes and cornmeal are just meant to be. 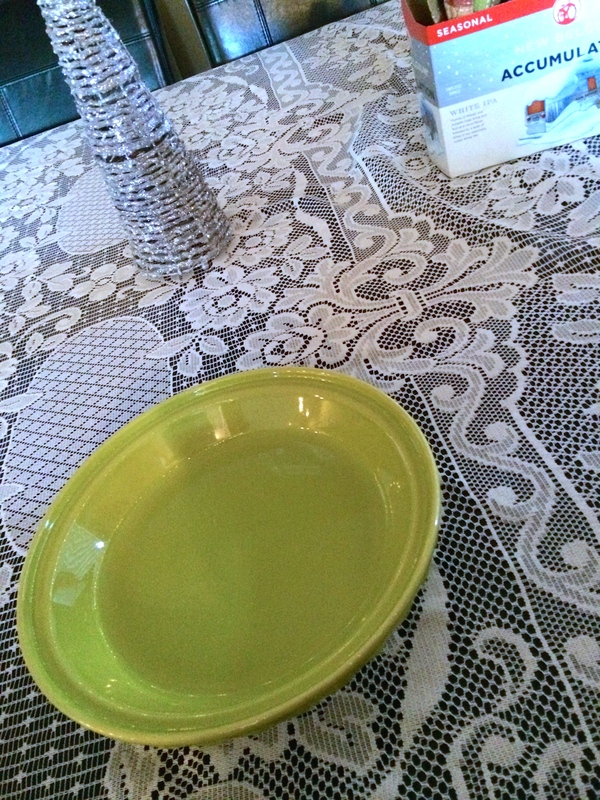 Cornmeal crusts mean that I get out these handy gadgets (thanks, Grandma Bonnie!) and place them on the outer rim of the crust before baking to protect from overbrowning. The rest of the pie does just fine without a shield, although you’ll probably still notice a little deeper of a color than you’ll get with a standard pastry. I really enjoy pictures of pie from this angle, looking right inside, as if you were about to reach in with a fork and just wedge off a little bite, making sure it contained both crust and filling. 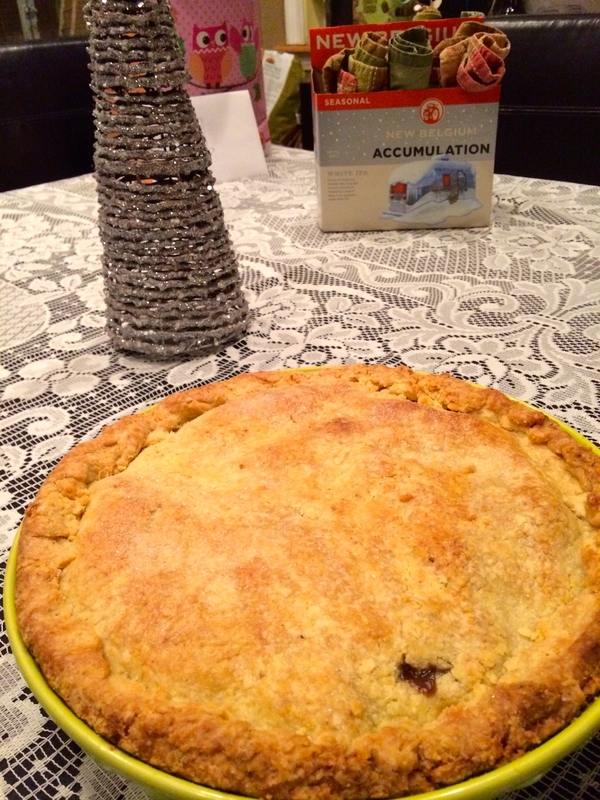 We were able to share this pie with many friends, including some Canadians who were not surprised at all by the contents of the filling and remarked that this was the way their family had always made mincemeat–with green tomatoes! 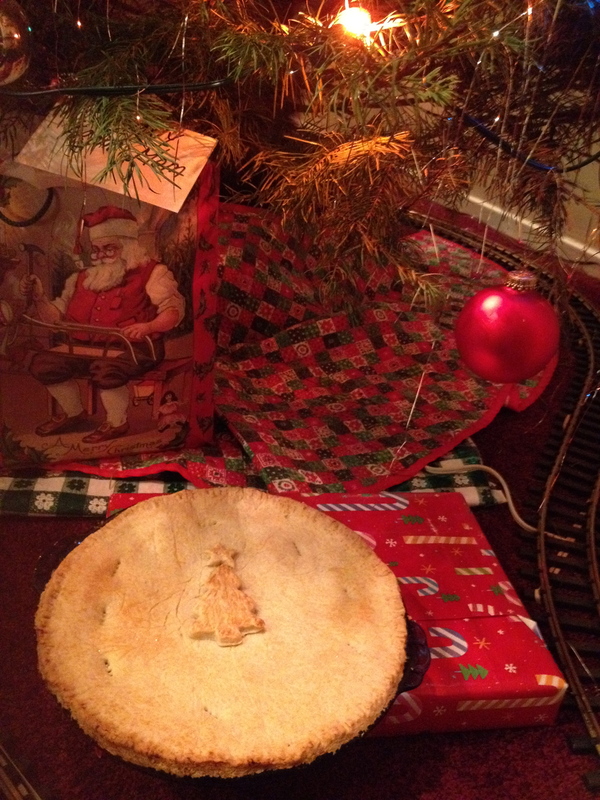 Then all of a sudden it was Christmas and I had to make a pie for Christmas. 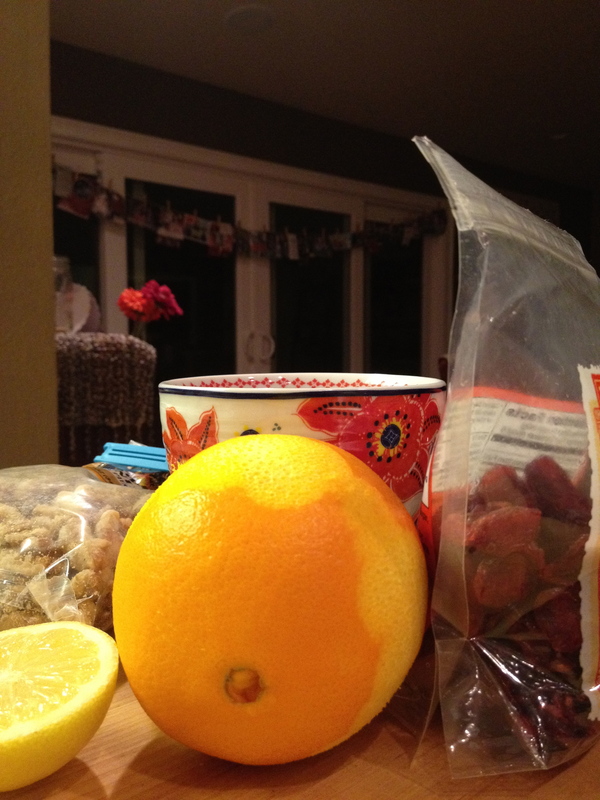 So I just made something I thought sounded yummy, and Christmasy. You can’t force this kind of thing. My commonwealth friends will know what I’m talking about when I say that I think the most Christmasy taste in all the world is mince pie. I guess to be specific, that taste is cloves. But yes. Very Christmasy. Ken Haedrich calls this pie Dried Cranberry and Walnut Funeral Pie, which doesn’t sound very Christmasy, or even slightly cheerful. But it definitely tasted like the holidays. 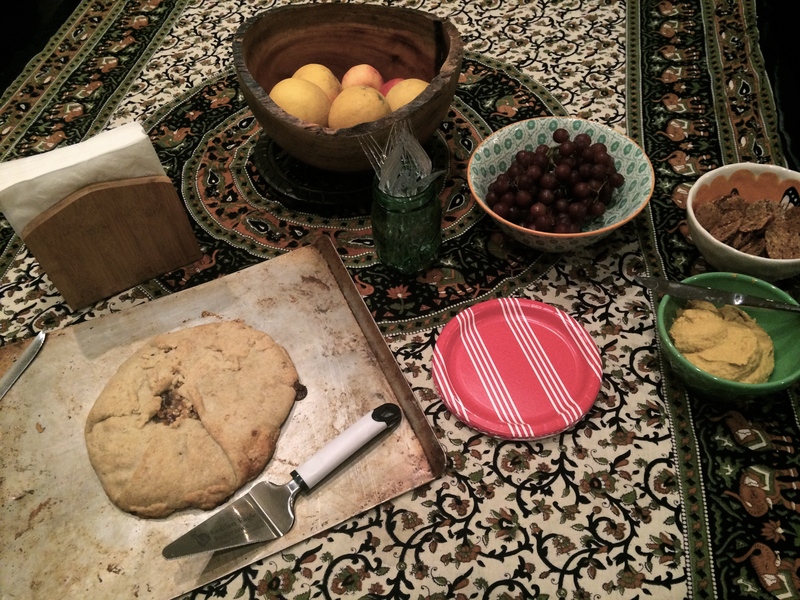 It was eaten without fanfare, on a cozy Christmas Eve. 200 pies to go. I wonder how many will be baked in 2013? Some of the key players. 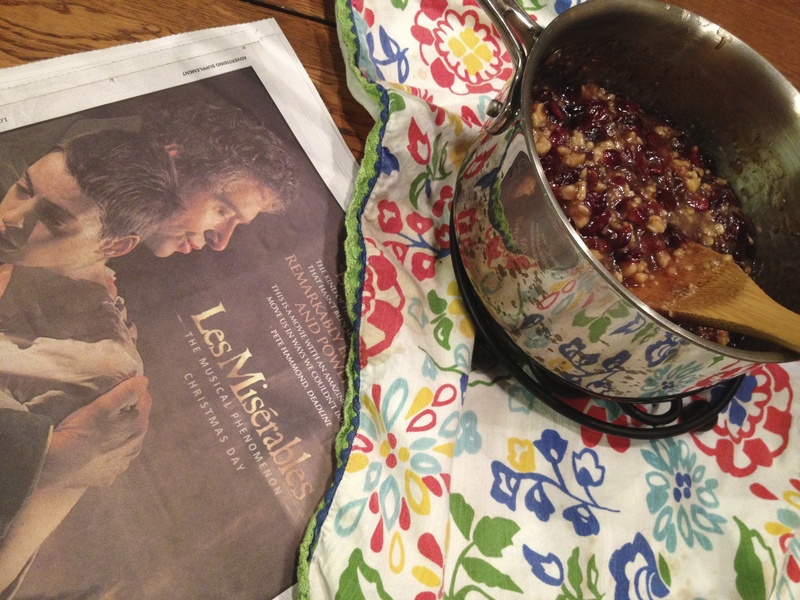 Stirring the filling/crying in anticipation for Les Mis. Typical. This pie was such a good poser, I couldn’t help myself. 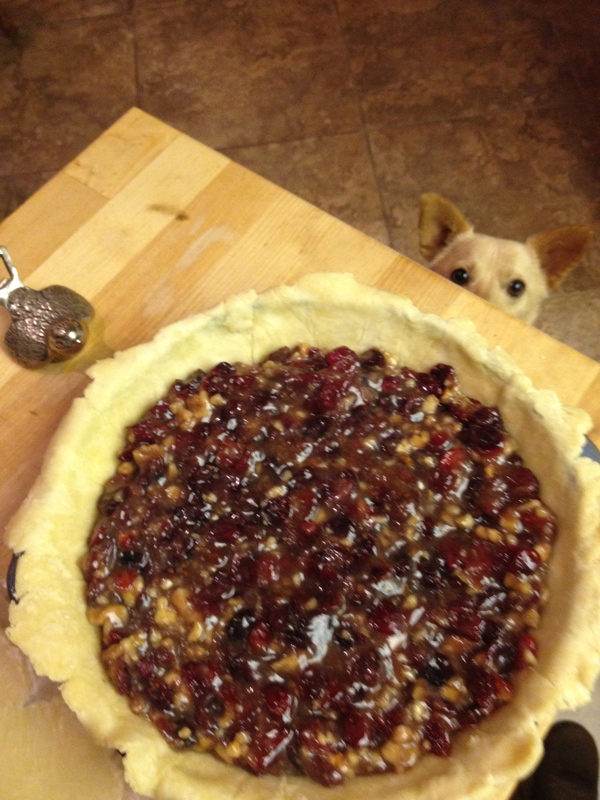 Pie waiting to become a ghost of Christmas past. Merry Christmas to all, and to all a good night. I hope you all had fantastic Valentine’s Days, by the way. One of these days I’ll start being seasonally accurate. But really, would that be as fun? 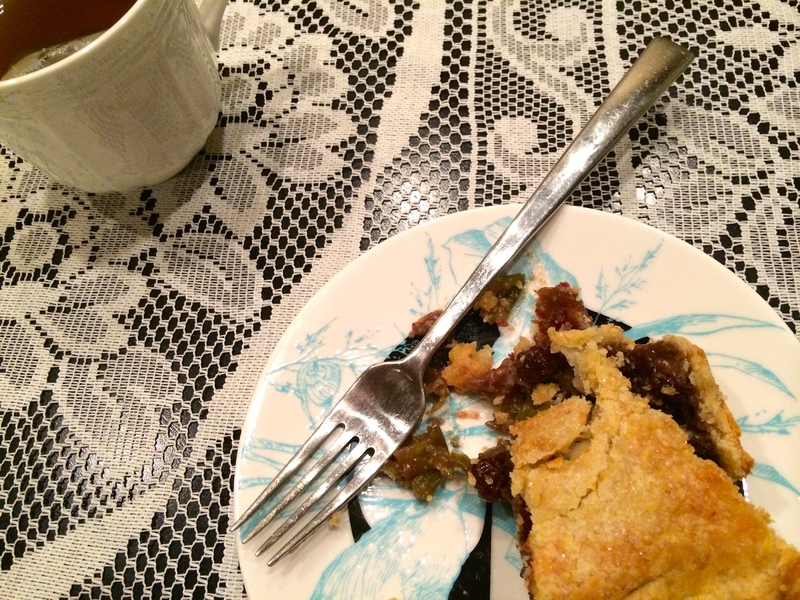 Most pie stories have happy endings. And then some of them end with you getting strep throat and missing out on the last three days of your Spring Break vacation and not getting to taste (or actually even finish making) the pie you made the day before you got sick. *Sigh. * But we won’t focus on these sad things. 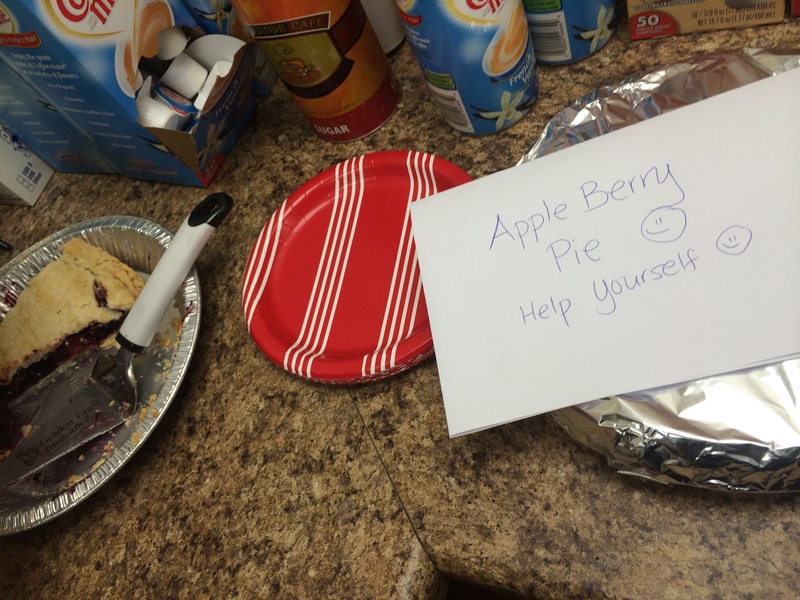 A few days after the events shown here, my relations decided that they hadn’t had enough pie. So the same crew mentioned in the above post, plus my cousin Alyssa (who is also an accomplished baker, though she is more of a cupcake girl) made a couple more pies. 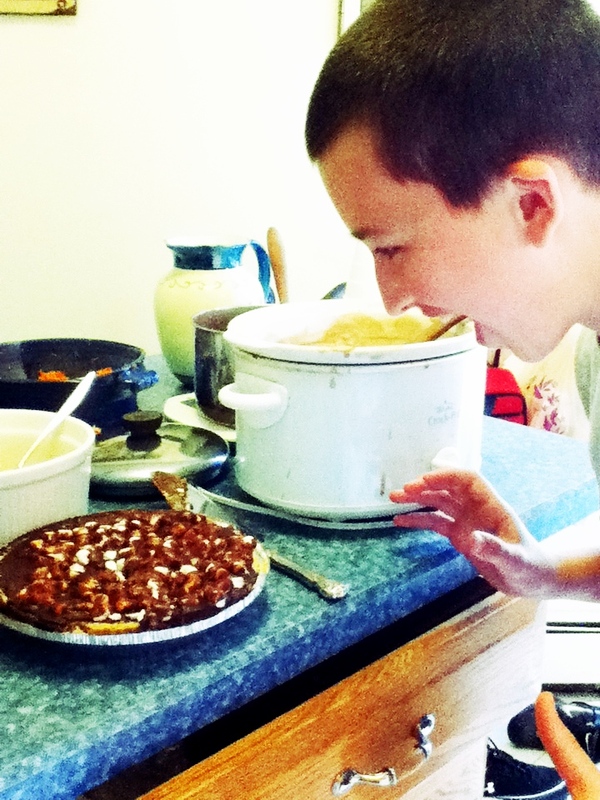 One of them was the Angus Barn Chocolate Chess Pie that I first made back in February. Let it be noted that this is the first repeat pie I have made since beginning this project. The combination of extreme deliciousness, easily accessible ingredients, and relatively short time until consumption made this an easy choice for a pie we all wanted to eat RIGHT away. The other pie we made was called the Ultimate Rocky Road Pie and needed to be refrigerated for quite some time before it could be eaten. 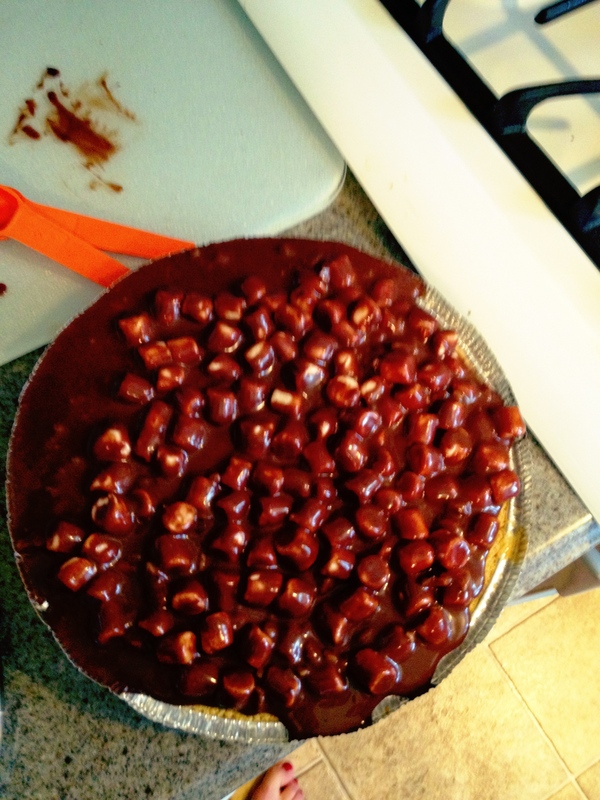 It basically ended up being a massive mess of marshmallows, melted chocolate, and walnuts. We spent some time dipping the nuts and marshmallows into the remaining chocolate scrapings, like fondue. And that’s as close as I came to tasting this pie. If you’ve never gotten strep throat before, don’t. It’s not a good time. You basically feel like you’re choking on your own uvula and swallowing nearly brings on tears. So I spent the last couple days of vacation lying in my friend Maggie’s bed instead of helping her set up her new apartment, writing her messages on my phone and trying to eat the soft fried tofu she lovingly prepared for me.